Visiting Verona is a treat for foodies because the standard of food and drink is exceptionally high. Because it’s one of the primary wine-producing regions in Italy and very close to Lake Garda (one of the biggest and most popular lakes in the country), locals are very discerning about the quality of products sold in “fair Verona”. The beautiful and historic city centre is packed with ‘osterias’ or traditional pubs; whereas in the UK beer would be served – in Verona the wine lists are as long as your arm! Beautifully matched with fresh pastas, risottos, cured meats and cheeses, the wine is mouth-watering, and it makes these atmospheric osterias a must-see when you’re in Verona. 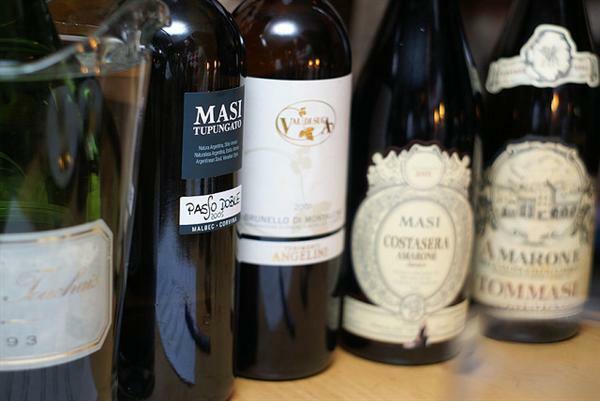 Not all of us can effortlessly select a wine bottle from a menu (particularly when it’s all in Italian) without suffering a moment’s hesitation. If you’re touring Verona to visit the grand Roman Amphitheatre and take a peek at Juliet’s House (where the balcony is of course an icon of Verona), then you may not have time to squeeze in a wine tour. However, winemaking in the region goes back centuries to the time of the ancient Greeks (although the name is thought to be a mixture of Latin and Greek meaning “Valley of Cellars”) and it’s well worth tasting the local wine well you’re there. So, here’s a Valpolicella cheat sheet with a list of the best wines to choose when you stop for a meal in Verona in-between sightseeing. Amarone is a renowned Verona wine made from mainly dried Cassabria (Corvina) grapes. This process results in a rich, strong taste that often has an aroma of raisins and cherries, and which is low in acid. It is best matched with very flavourful dishes that can absorb its robustness, for example, steak, beef, sausages or kidneys. A hearty serving of Ossobuco (a Milanese dish of veal braised with wine and cooked in vegetable broth) is another good match. Like Amarone, these wines are made from the Corvina, Rondinella and Molinara grapes, but they’re inexpensive and designed to be shared with a nice pizza, tomato-based pasta or whatever else is fresh in the kitchen! They’re usually labelled Classico, Superiore or Classico Superiore, and the latter two are aged for just over a year. This wine is made in high quantities and although it has suffered negative reviews in the past, newer winemakers are rapidly improving its international reputation. For those who are not big wine drinkers, a small sip of wine with dessert is a nice way to get an introduction to Verona’s delicious wine and learn about the city’s fascinating history. First made in Roman times and reportedly a favourite of Emperor Augustus, Recioto was sweetened with honey, spices and watered down with water. In terms of food pairings: sweet almond cookies or cantucci, soft local cakes such as sbrisolona or dark chocolate cake are good choices. For a lighter dessert, try it with strawberries and cherries, or a chunk of mild Gorgonzola. If you have the time to squeeze in a visit to a wine estate, you’ll find you’re really spoilt for choice in terms of the number and variety. For Amarone tasting, Allegrini wine estate is a top winery that’s well worth visiting, while Fratelli Vogadori has a range of Valpolicella and Amarone wines that are worth trying. While there are many Amarone-producing vineyards in the region, there are a few well-known ones that are worth checking out; have a look at this map that highlights the best wineries in Valpolicella before you set out. About the author: Ellie Smits is a lifestyle writer who has a soft spot in her heart for wine. With over ten years of experience, she focuses on spas, nutrition and lifestyle stories, but during her latest holiday to Italy she focused on the health benefits of drinking wine (in moderation, of course)!